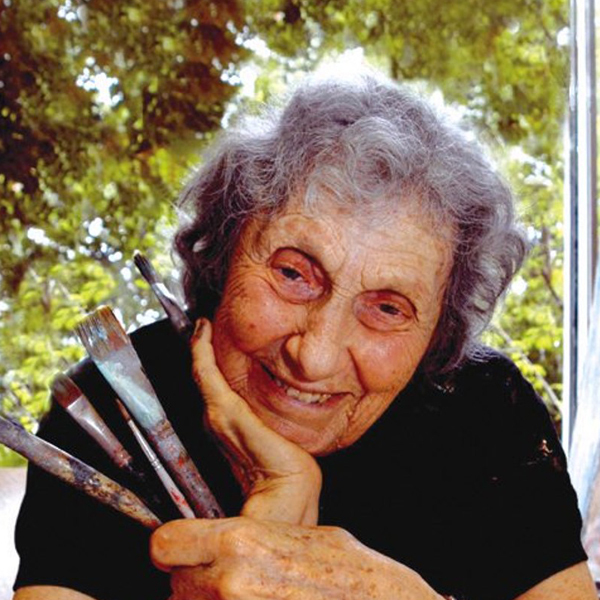 Edna Hibel, a painter of sentimental pictures of children, has had a more than 60-year career as painter and lithographer and promoter of peace through exhibitions of her artwork. She was born in 1917 in Boston, Massachusetts. Her parents were Abraham and Lena Hibel, and she was raised in the Boston area and educated at Brookline High School where she met her future husband, Theodore Plotkin. She began to paint when she was nine years old and learned watercolor during summers at the shore where her family vacationed in Maine and Hull, Massachusetts. Hibel studied at the Boston Museum School of Fine Arts, from 1935-39, receiving a Sturtevant Traveling Fellowship to Mexico. In Boston, in 1966, she began lithography, continuing in 1970 in Zurich, where she still works every year. She has created lithographic works with up to 32 stones (or colors) on paper, silk, wood veneer and porcelain. The latter pieces are called lithographs on porcelain and result from a complicated process, that she keeps a secret, whereby she transfers stone lithographic color separations onto Bavarian hard paste porcelain. Hibel has created the "Arte Ovale" series and various plaques with this technique. She organized the Edna Hibel Museum of Art, in Jupiter, Florida, to display and promote her work and also created a United Nations stamp, "Mother Earth." In 1995, she was commissioned by the Foundation of the U.S. National Archives to commemorate the 75th anniversary of women receiving the universal right to vote. At the ceremony, Ms. Lucy Baines Johnson referred to Hibel as the "Heart and Conscience of America." In November, 2001, the World Cultural Council based in Mexico City gave her the Leonardo da Vinci World Award of Arts. Hibel's work has been exhibited in museums and galleries in more than 20 countries including Russia, Brazil, China, Costa Rica, and the United States, and under the royal patronage of Count and Countess Bernadotte of Germany, Count Thor Bonde of Sweden, Prince and the late Princess Rainier of Monaco and Her Majesty Queen Elizabeth II of England. Pope John Paul II gave her a medal of honor as did the late Belgian King Baudouin. She also received honorary Doctoral degrees including from Eureka College, and Northwood University of Florida, Michigan and Texas. She also has received many humanitarian honors for her charitable efforts for children's and medical charities. Her exhibitions "Golden Bridge" and " Peace Through Wisdom" were efforts to promote peace and cultural understanding between China, the United States, Yugoslavia and Russia, and a television documentary titled "Hibel's Russian Palette" was based on her trips and art shows in Leningrad, now St. Petersburg. In 2001, Edna received a Lifetime Achievement Award from "Women in the Visual Arts," an organization of artists in the South Florida area. Today (2003) from her home and studio in Riviera Beach, Florida, Hibel continues to paint in oil and watercolor and also hand enhances her original stone lithographs, serigraphs and giclee with pastels, oil paint, gold leaf, pencil, ink, conte crayon and charcoal.